Republican tax insanity becomes certifiable. 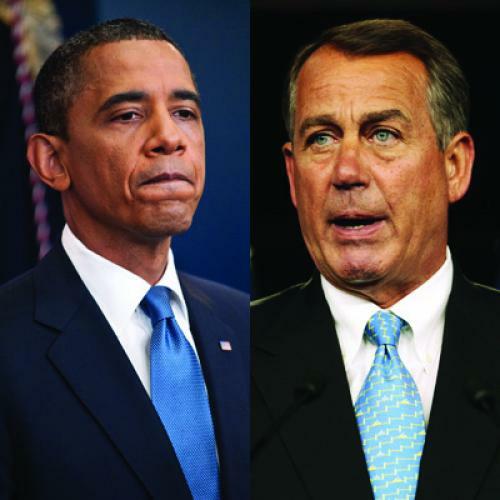 It’s unclear what brought on Boehner’s temporary and uncharacteristic fit of idealistic mania. He had reportedly spent a lot of time talking privately with President Obama, growing convinced of the need to do big historical things. Perhaps he contracted a Washington version of Jerusalem Syndrome, succumbing to delusions of grandeur and forgetting he was serving at the pleasure of a party inalterably opposed to the sort of bipartisan compromise he envisioned. In any case, Boehner woke up from his fantasy world and faced the deranged reality of the party he’s actually leading. The GOP defines itself as a Reaganite party. That, however, isn’t exactly true. Ronald Reagan did pass a huge, regressive, debt-financed tax cut during his first year in office. But Reagan’s advisers understood that they had overreached and spent the rest of their presidency backtracking. Reagan signed a series of tax increases that clawed back about a third of the revenue lost from his big tax cut. He also signed legislation in 1986 that cleansed the tax code of many of the loopholes he had helped open and shifted a greater share of the effective tax burden onto the rich. In all these ways, Reagan’s actual record is anathema to his modern-day worshippers. The true foundation of the contemporary party is the 1990 budget deal, an agreement between George H.W. Bush and congressional Democrats to combine spending cuts, future budget controls, and higher taxes. House conservatives, led by Newt Gingrich, revolted against the deal and eventually overthrew the moderate leaders who acceded to it. In the years that followed, conservatives endlessly recounted the story of the virtuous Reagan who refused to compromise his principles and therefore won reelection, followed by the wicked Bush who raised taxes and, as a result, lost reelection. They forced Republicans to sign a no-taxes pledge and ran primary campaigns against incumbents who flirted with bipartisanship. The whole apparatus of the conservative movement is built to prevent a recurrence of 1990. Now, take this underlying dynamic, and overlay it with the results of the 2010 election. Republicans concluded from that victory not that they would share power with Obama, or even that they would halt the further advance of his agenda—as Democrats concluded about George W. Bush after the 2006 elections—but that they were now the incarnate of the public will and sole repository of public legitimacy. “This is about listening to our country, listening to the people who just elected this Congress to restore discipline with respect to our spending,” said one freshman Republican. Even party veterans adopted this stance. “The principle of not raising taxes is something that we campaigned on last November,” said John McCain, “and the results of the election was the American people don’t want their taxes raised and they wanted us to cut spending.” In the right-wing mind, any claim to legitimacy from Obama or Senate Democrats had been superseded by the previous election. Viewed in this peculiar light, compromise with the president would violate not just policy goals but democratic principle itself. That is the context in which to understand the GOP’s rejection of Obama’s offer. The president had proffered a $4 trillion deficit reduction, of which 80 percent would consist of spending cuts. How accommodating was that offer? It’s the same ratio of spending cuts to tax hikes proposed by U.K. Prime Minister David Cameron—who controls the entire government, not just one-half of one branch. Want another measure? Researchers at the conservative American Enterprise Institute studied the history of fiscal consolidations in developed countries. They found that the successful examples consisted, on average, of 85 percent spending cuts and 15 percent revenue increases. That, of course, is close to the deal Obama put on the table. And the United States begins from a position of having some of the lowest effective tax rates in the advanced world. The GOP’s fixation with tax rates itself ignores the fact, affirmed by such conservative luminaries as Milton Friedman, that the size of government is defined by spending levels, not revenue levels. Financing the spending via debt merely postpones the taxes that pay for it. Since spending is all that matters, reducing spending, even while raising taxes, reduces the size of government. There is no small-government rationale to turn down spending cuts on account of tax hikes being part of the deal. But that’s not true. Press accounts reported that Obama, distressingly, proposed to make future revenue increases from the Bush tax cuts’ expiration—the tax hike Douthat warns will happen later—the source of the revenue in the deal. In other words, he was willing to bargain to get something he could have gotten by doing nothing if he wins reelection. What’s more, Obama offered to prevent any increase in upper-bracket tax rates in 2013, as long as Republicans agreed to close tax loopholes to make up the revenue. That is the deal Republicans refused—a deal to lock in the top-level Bush tax rates, while raising more revenue from a cleaner tax code, while getting Obama’s sign-off on large-scale cuts to entitlements. Republicans may wind up signing an agreement to raise the debt ceiling in return for spending cuts and no net tax revenue increase. They’re walking away from much deeper spending cuts, rather than agree to a tax hike that’s scheduled to happen anyway. The Republican opposition to budgeting has moved past radicalism and proceeded into outright pathology. Jonathan Chait is a senior editor at The New Republic. This article originally ran in the August 4, 2011, issue of the magazine.